Split 'em, hit me, double up. It is a fact of life that men love to gamble. Among the gambling and betting games Blackjack which can also be called as Perfect Pairs, 21 or Pontoon is the most popular gambling game. According to recent statistics, Australian men spend more money on gambling than anything else! 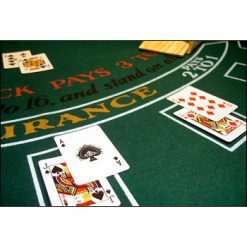 Given that Australians love gambling, here is a perfect gift for them – Blackjack Table Cloth. It allows the gamblers to deal with their rivals with better scores and points. The goal is being dealt nothing less than an Ace and a “picture” card. The gamblers will have a lot of fun when they start betting with a good deposit. The Blackjack Table Cloth has a smooth and consistent playing surface made of felt. Friends, family, and even colleagues can enjoy the game together. The tablecloth is made of smooth felt material measuring 180 x 90 cm to accommodate more players with ease. So hurry up and purchase this unique tablecloth for some gambling fun. You can set it up anywhere and all that you need is a pack of cards, determined players and a banker! 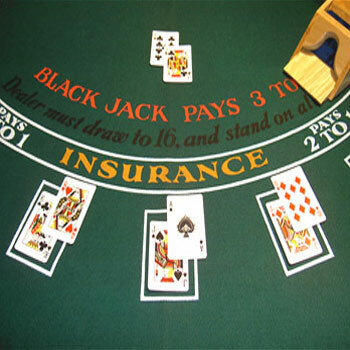 Each Blackjack Table Cloth comprises felt material (compressed & matted fibres), card game instructions and measures about 180 x 90cm when in use. Please note: This product is sold for personal use and its entertainment value only.